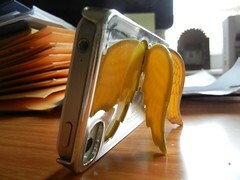 My girl Jeskat just gave me this shiny and functional iPhone case for my new iPhone 4S, straight from Singapore. 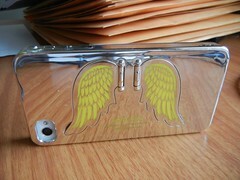 I love the angel wings design on the back. And the wings hinge out to make a stand for watching videos and slideshows…. Or zooming your phone around and making "whoosh" sounds until she tells you to stop. where can i get my hands on the same iphone angel stand as yours they all seem to be plastic and bright colours, would prefer the colour u have!